There's no doubting the Xbox One X's power and, when it's fed games that have been programmed to tap into that, the audio-visual experience is best-in-class. In many respects Microsoft's new Xbox One X system is a perfect example of how history can repeat itself and, for us here in the industry, so can product reviews. Last year Sony's PS4 Pro blew T3 away hardware-wise, with its 4.2 teraflops of computing power elevating the gaming experience on Sony's platform superbly, with higher resolutions and framerates, more particle effects, better physics, HDR and more brought to games across the PlayStation library. Indeed, while there was few titles at launch that fully exploited the system's enhanced power, by the end of the system's launch window over 50 titles immediately benefited from its extra power, either new games programmed from the off to exploit it, or old titles patched to enjoy just a little of it. And over the past year the PS4 Pro has gone on to offer the best-in-class audio-video option for gamers whenever a new multi-platform title is released. Partnered with a suitable setup of 4K, HDR television and surround sound system or headset, the experience the PS4 Pro offered was unashamedly premium - with Sony recognising and then carving out a new high-end gamer tier in the market - and fantastically immersive and vivid, with the system demanding to be the centre of your home entertainment life. You had to pay for that premium experience for sure, but the payoff was spectacular. Now 12 months later Microsoft has, arguably, followed Sony's lead in releasing its own platform's premium, top-tier console with the Xbox One X. And boy has it gone premium. Which is better, Xbox One X or PS4 Pro? Both Sony and Microsoft's consoles can output 4K, HDR resolutions, so determining which games you like (Forza Motorsport 7 or Gran Turismo GT, for example), how much money you have to spend, and what multimedia capabilities you want from your machine is crucial in choosing between the two. Xbox One X is better technically than the PS4 Pro, as it is more powerful and finds it easier to push native 4K gaming resolutions. However, the PS4 Pro can also handle 4K, HDR gameplay too via some clever upscaling tech, so it all depends on your ecosystem preference, budget (the PS4 Pro is £100 cheaper), and desire for a Ultra HD Blu-ray player, which the X comes equipped with. 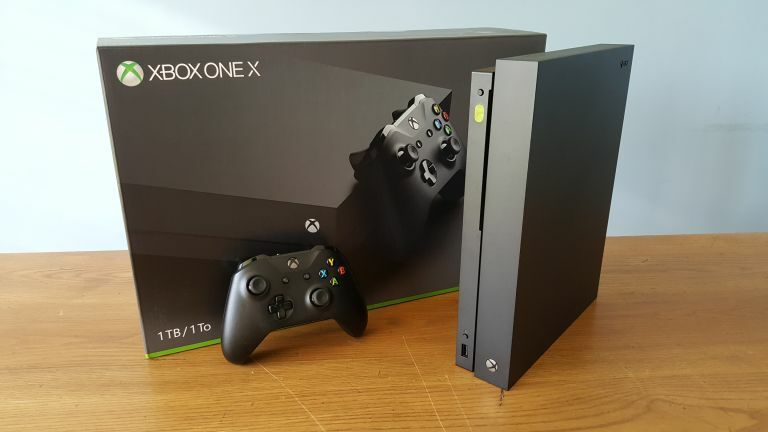 Loaded with 6 teraflops of computing power (that's a 50 per cent increase over the Pro), as well as HDR support, Dolby Atmos compatibility and a full-blown Ultra HD 4K Blu-ray player, the Xbox One X is not only the most powerful video game console ever made to date, but also an incredibly well specced multi-media entertainment hub, which even outstrips the PS4 Pro in versatility. The X has not only repeated what the Pro achieved, but has taken it to a new level. Let's now move on to T3's official Xbox One X unboxing video. Unboxing the Xbox One X reveals a system that, weirdly, is kind of reminiscent in terms of shape and design as Sony's classic PlayStation 2 console. This is especially true when orientated on its end, with a notable overhang looming over its disc slot, eject and sync buttons, as well as front-facing USB port. The console carries over the tasteful dimpling pattern we saw first introduced on the Xbox One S on its side panels and, in height and width, it is just slightly its junior. In terms of density the Xbox One X feels incredibly solid and exudes a premium feel in the hand. In terms of ports, the Xbox One X is essentially identical to the Xbox One S with power, brace of HDMI (in and out), pair of USB 3.0, IR out, digital audio out, and network cable connector located on its rear panel. Asides from the new console, the Xbox One X box also includes an Xbox One X controller with pair of batteries, HDMI cable, power cable, quick start guide and pair of trial codes for Xbox Live Gold and Xbox Game Pass subscriptions. In terms of pure hardware the Xbox One X is quite interesting. Its 6 teraflops of horsepower is roughly equivalent to a mid to high-end PC gaming GPU, which on the market today costs almost as much as the console itself. So when you consider that along with its 6 teraflops of computing power the Xbox One X also comes with 12 GB of GDDR5 RAM, and has a GPU engine that runs at 1172MHz, it appears an absolute steal. Indeed, to build a PC gaming system that has the same power of the Xbox One X would cost at least twice the price. Comparing the system directly to a gaming PC is a little unfair though, with a more accurate barometer of its hardware power and value Sony’s top-of-the-line console, the PS4 Pro. The PS4 Pro packs just over four teraflops into its larger chassis, making the Xbox One X 50% more powerful in a pure “Fight of the ‘flops” smackdown, however, the system does retail for £100 less and always has, with the console priced at £349.99 at launch. Also, we must note here, that pure hardware specifications do not always equate to enhanced gaming performance, with programming, drivers and optimisation often key in squeezing out true potential. The only hardware area that seems unremarkable is the Xbox One X's storage capabilities, with only a 1TB hard drive coming as standard. This isn't cripplingly low or anything, with that more than enough for 10 or so AAA games to be installed on the drive at once, however considering that we have got used to the S's 2TB hard drive, it definitely felt like a downgrade. Surprisingly, the Xbox One X packs all its power into a chassis that’s, as we mentioned earlier, actually smaller (30cm x 24cm x 6cm) than the Xbox One S that preceded it. Granted, to really see the difference you have to put the two consoles side-by-side, but it’s nice to know that you won’t have to make any extra space on your AV shelf to accommodate Microsoft's latest console entry. In terms of pure design it's interesting how Microsoft has toned back the console in the Xbox One X, with the system a rather unmemorable, space grey-black box. This is almost undoubtedly because of the shift in demographic pitch for this premium system, and while that is almost certainly the right decision, as after all you wouldn't want a garish plaything clashing with your high-end audio-video setup, we do feel the design lacks a certain desire factor. It will, however, unobtrusively slot in between your Dolby Atmos decoder and turntable amplifier just perfectly. Having this edge in the power department over the PS4 Pro means that the Xbox One X is much more capable of producing the 8 million plus pixels that are required for native 4K, while its competitor makes do with some, admittedly clever, upscaling trickery. The biggest advantage of this 4K resolution is pure detail. With four times the amount of pixels, even the smallest details are clearly visible, and even the most distant objects are distinct thanks to larger draw distances. A great example of this was demonstrated when we played Assassin's Creed Origins, with the X not only allowing the game to be rendered in 4K, but also offer twice the detailed draw distance in the environment when compared to it running on an Xbox One S. Also, thanks to the 12GB of RAM onboard the X, transitions between the protagonist Bayek and his eagle Senu, which you can pilot in an in-game scouting mechanic, were very smooth and seamless. Another good example of the power of the X came while playing the programmed-for-native-4K Forza Motorsport 7, which was absolutely spectacular, with everything from the vehicles and their interiors, to the tire-marked race tracks, and onto the lush, surrounding environments both incredibly crisp and fantastically detailed. Forza’s cars also showed off the benefits of 4K in seeing objects in the far distance, which remained clear when at a lower resolution they would have become fuzzy due to the smaller amount of pixels available. Indeed, when we booted up Forza on the Xbox One S, while the fluidity of framerate and overall experience remained the same, draw distance, texture details and weather effects all weren't at the level of the X, with some marked downgrades. Not only does the Xbox One X have the raw power to output games in a native 4K resolution, but it is also optimised for televisions capable of HDR, or high dynamic range, which is probably the most boring name for the most interesting piece of screen technology we've seen emerge in the last few years. Put simply, HDR increases the maximum brightness and darkness a television is able to display. With this increase in contrast, images not only have more pop to them, but brighter areas have more sparkle to them, and darker areas have more detail. Check out the above capture video that T3 took recently of Rise of the Tomb Raider running on the Xbox One X connected to a 4K, HDR TV. As you can see, HDR's ability to have enhanced contrast between the lightest and darkest parts of the picture really elevates scenes like this, with the damp, dark, surrounding cave tunnel juxtaposing brilliantly with Lara's glow stick light source, as too light bleeding in from the exterior. In what was news to T3's ears when it was announced, the Xbox One X offers support for Dolby Atmos, the company’s newest audio format, which has sound come down from above you, as well as in front and behind to create an incredibly immersive surround sound experience. Now T3 has only managed to test out Atmos outside of T3 Towers for the moment, so until we have put the console through its Dolby Atmos paces in our testing environment we won't pass definitive judgement. However, from what we have experienced so far of games running with Atmos enabled, it was incredibly immersive - there was something really cool about suddenly hearing a helicopter flying overhead in Gears of War 4, for example. Want more details on how Dolby Atmos works and what you need to get it? 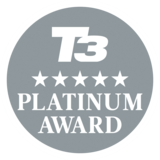 T3 has got you covered. With all the steps forward Microsoft is taking in the gaming department, it’s almost easy to forget the console is also a 4K, HDR media player in its own right, with its Ultra HD Blu-ray player allowing you to consume 4K movies and television shows without having to worry about internet buffering, as well as lower picture and audio quality. As we did with when testing the Xbox One S, we threw a variety of 4K films and documentaries at the Xbox One X's Ultra HD Blu-ray player, including Planet Earth II, Salt, Hancock, The Amazing Spider-Man II, and Batman vs Superman: Dawn of Justice. And, as you would expect considering this is the same drive as in the S, the results were just as good. The crispness of imagery and wide-range of contrast were top draw, while thanks to the quality of our test Samsung television, colours popped and details really stood out. There were no setup issues or compatibility problems with getting the X to display at 4K and with HDR enabled either, with the system very much plug and play in that regard just like the S that preceded it. We were automatically prompted to enable a 4K resolution and HDR can be turned on and off simply in the options menu of the console. The Xbox One X is a powerful piece of kit, and it’s capable of producing images that are truly stunning to behold but, trust us when we say this, you’ll definitely need a premium setup to be able to fully benefit from it. We noted a year ago that the PS4 Pro was overkill for anyone who doesn't have a 4K TV and, if anything, the Xbox One X is even more so thanks to its even greater emphasis on 4K gaming and viewing, so unless you are already hooked up or are prepared to upgrade your whole audio-visual setup, then you almost certainly need to cool off for a while. On the television side you’ll need a set that supports both 4K and HDR, and although these technologies have firmly entered the middle-range of the market, they’ve not quite made it into the realm of supermarket tellies just yet. Yes, if like most people, you’re still enjoying your HD television then your games will look better due to the new console’s use of ‘supersampling’ and various small visual enhancements, but the benefit you’ll see will pale in comparison to what an Ultra HD set is capable of. Meanwhile on the audio side you’re going to need a decent, Dolby-equipped soundbar or home cinema amplifier to get the benefits of vertical, object-based audio. Although some high-end TVs are now building this technology in, they’re still very much in the minority. But that’s kind of the point of the Xbox One X. It’s a console that’s designed to make full use of the most high-tech home theatre setups that exist right now, to really push them to their limits and make use of all of their bells and whistles to produce a gaming and viewing experience like no other. So no, be under no illusion, the Xbox One X is a premium piece of kit and you’ll need a premium set-up to truly appreciate it. As such, if you’ve been looking for a console to finally catch up to your premium 4K, HDR, surround sound home cinema setup, then this is it. There can be no doubting the Xbox One X's power, with Microsoft's new console capable of pushing out over a whopping 8 million HDR-equipped pixels. Indeed, from what we've played so far, games look and sound better than they ever have before and, when the hardware is fed a title built purposefully to tap into its raw power, such as Forza Motorsport 7, the audio-visual experience is spectacular. If you're thinking of pulling the trigger though, then you better make sure you have the setup to fully appreciate the X before parting with your hard earned cash. April 10, 2019 - You can currently pick up the 1TB Xbox One X console for £386.91 at Amazon, which is a marked price drop over its launch cost. FPS fans would probably be better off picking up the 1TB Xbox One X and Battlefield V bundle edition, though, which is ringing in for only £389. Spend a few more quid and get a top shooter to play on your new console. Over on eBay refurbished models are going for between £300 and £350, while properly used systems with bundles of games can be picked up for a similar outlay. The much sort after white 1TB Xbox One X console, used, is still going for over £400, while the Project Scorpio Edition consoles range in price from £280 to £330 depending on condition and the amount of bundled games. The successor to the Xbox One X, which has been dubbed the Xbox Two, is set for release no earlier than 2020, with one rumour indicating that both Sony and Microsoft will pit their new consoles against each other at E3 2020. That would be where they could be announced, though, with a release taking place later in 2020, likely in the run up to Christmas. As such, we don't expect a sudden price crash on the Xbox One X, as it still has plenty of time to run before a more powerful console can usurp its position.